As a Tidal subscriber, I welcome Apple acquisition—assuming lossless tracks are made available through the fruit-logo company's music services. Not that anyone should seriously believe the rumors. But one can hope. Merger talks are typically silent affairs. When they're serious, you don't hear about them until there is a deal. Reasons are many, with regulatory being among them when public companies are involved. Acquisition rumors often mean something else: Principal party leaks information about preliminary or ongoing discussions to gauge customer and shareholder reaction; one side or the other is dissatisfied with progress/terms and seeks to apply pressure. I don't doubt there are, or have been, Apple-Tidal merger meetings, particularly given the leak went to the Wall Street Journal. The two music services would be better together rather than competing apart. 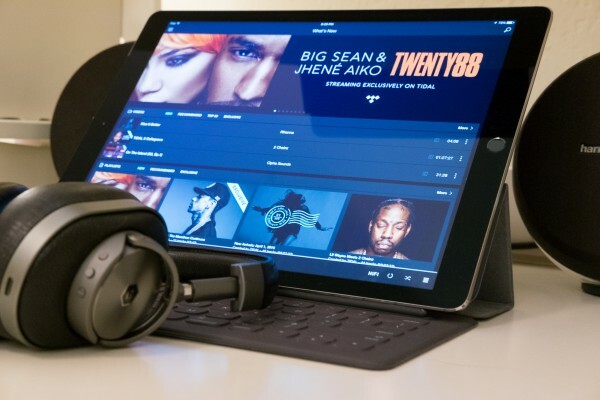 Tidal exclusive content and major artist support would add much to Apple Music. That's without considering the huge appeal to lossless streaming, for which ditz-for-brains like me gladly pay more for. That's $19.99 per month, when other major music streaming services cost half as much. Hell, Apple and Google give multiple-user (e.g. family sharing) access for $14.99 monthly. For cost-savings reasons, I have cancelled Tidal at least three times, then resubscribed weeks later—because I can hear the difference between 256kbps AAC or 320kbps MP3 and 1411kbps FLAC (Free Lossless Audio Codec). In Tidal parlance: HiFi. You can hear it, too, and anyone who says that you can't is moronic. There's a difference between what you can hear and what you want to. The can is ridiculously obvious when comparing vocals, which are clearer and crisper on Tidal's FLAC than Apple's lower-bitrate AAC tracks or competing services' MP3s. With a decent pair of headphones, anyone should be able to hear that difference—and there are many other subtleties that make the music more enjoyable for listeners and truer to the artist's intentions. The want is something else. A generation of music consumers is accustomed to muddier sound because of highly-compressed AACs and MP3s. FLAC is compressed, too, but not nearly as much—and most lossless codecs can achieve fidelity close enough to CDs that no one can discern the difference. Interestingly, in my experience, many people who say they can't distinguish, say, 256kbps AAC from lossless AAC or FLAC actually do. They typically will choose the track with muddier sound because that's what they are used to listening. The fidelity is familiar. Lossless streaming (or sales) makes lots of sense for a service owned by artists (Jay Z principally) and catering to them. FLAC delivers to their fans something closer to the studio sound—and Tidal exclusives are absolutely all about the fans. They range from exclusive albums, tracks, and videos to the live Tidal X performances. You want to stream, rather than buy, from Prince's music catalog? Tidal is your only legal option. Apple wouldn't just buy a music service, but relationships—with artists and their fans. Then there is Jay Z, should he stay on. Apple Music, launched last summer, derives from Beats. which the bitten-fruit logo company purchased for $3 billion 26 months ago. Beats also brought prestige and talent: Rapper Dr. Dre and producer Jimmy Iovine. Jay Z would increase the cache, along with some of the other artists committed to the venture. Exclusive content comes, too. Tidal, with close to 5 million subscribers, should appeal to younger artist-obessessed fans and older audiophiles like me. Presumably, people using the service don't subscribe to Apple Music, which would add users and broaden its appeal and demographic reach. That is, assuming exclusives and lossless remain. Tidal's dark user interface is classy cool, something that Apple would surely abandon for its color-set-against-white UI. Video selection, all free for subscribers, is a surprisingly fresh alternative to Vevo and YouTube—particularly exclusives, including Tidal X concerts. The curated playlists are among the best available anywhere, too. The video collection is superb, as is playback. Tidal feels like an artist showcase, not record labels’. Exclusive content is plentiful and frequently updated. Tidal X live concerts connect artists and fans—fidelity rocks! Many albums are available in U.S. and/or international versions. Despite exclusives, selection falls far short of Apple Music and other major services. The library is smaller 15 months after I signed up. Some albums I listened to last year, particularly international versions, are gone. Tidal doesn't sync searches and song selections across devices (what you do on your phone doesn't jive with your laptop, for example). The default mobile app bitrate is 320kbps. Subscribers must open settings and choose lossless streaming, and most of them won't know to do so. Because of the aforementioned sync limitations, streaming and downloading bitrate must be manually changed on every device where subscribers use Tidal. I can think of few reasons why either service wouldn't benefit from a merger, particularly with Apple Music's refreshed (but not without annoyances) design. Subscriptions and sales are other checkmarks in the beancounter's ballot for why the merger makes sense. Apple could charge more for lossless tracks, whether purchased or rented. Apple's business is all about incremental improvements based on longstanding and successful retail principles. One of these is the 'pay more' principle. There is always someone willing to pay more. Clothing stores use this approach when bringing in cool new wears. Somebody will pay full price to look good—to look cool. Stores maximize early sales from full-price buyers, then generate several new waves of sales through ongoing discounts. Apple's approach is somewhat similar. Apple's newest, trendiest products—like iPod, iPhone and iPad at their respective launches—tend to be higher priced. The products are perceived to be cool. Early buyers are willing to pay more for cool, and Apple certainly doesn't discourage them from doing so. The approach allows Apple to maximize margins at the front end. The company then iterates—incrementally improves —the products over time. The process is essential to Apple maximizing margins. The "pay more" principle also applies to adding SKUs of products or services that command greater selling price, without raising existing prices and perceived value around them. Consider, for example, 256GB iPad Pro, which pushes up the selling price at the top tier. Likewise, ditz-for-brains like me who already shell out $20 a month for lossless listening will continue to do so, and others will join them on Apple Music. People pay more, generating greater recurring revenue from the subscription service or from increased prices for lossless albums and singles compared to 256kbps AAC. People like me, who have large libraries of iTunes-purchased music, could receive free upgrades to lossless or pay nominal extra fee (Apple has done that in past). Say, Jay Z, I love Tidal, and my 20 bucks a month is yours for the foreseeable future. But we both might be happier if you sell to Apple.